Pushups can increase the size of your triceps and forearms. The gym is packed and there isn't any equipment available -- machines or free weights -- to work on your arms. 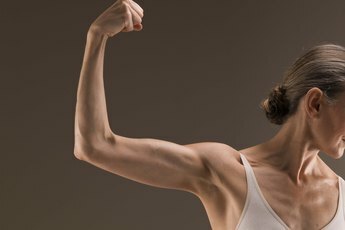 Don't worry, you can still get strong, lean arms, especially your biceps and triceps, by using your body weight alone. With some floor space and a pullup bar, you can get a quick, 10-minute arm workout while strengthening your entire body simultaneously. Warm up by swinging your arms side to side and up and down, and taking a few, deep breaths before you start training. Put your hands on the floor beneath your shoulders. Extend your legs behind you with your toes on the floor. Inhale as you lower your body toward the floor until your chest and hips are almost touching the floor. Do not stick your head forward. Exhale as you push yourself up until your arms are fully extended. You should feel your chest, shoulders and triceps working. Perform three sets of eight to 10 reps. Stand beneath a pullup bar that is one to two feet above your head. Jump up and grab the bar with both hands hands facing toward or away from you. Your hands should be about shoulder-distance apart. Exhale as you pull yourself up until your head clears over the bar. Do not stick your head forward. Inhale as you lower your body until your arms are fully extended. 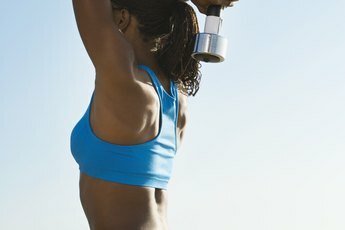 You should feel your back, biceps and shoulders working. Perform three sets of eight to 10 reps. Stretch your back, chest, arms and shoulders after your workout to alleviate tension and stiffness. Start with stretching the bigger muscle groups first before your arms, such as stretching your chest against a doorway. If you cannot perform either exercise well, there are variations of pullups and pushups. For pushups, you can do them on your knees or with your hands on an elevated surface, such as a table or stair step. For pullups, you can do an incline pullup by using a squat bar on a squat rack. Adjust the bar's height to between two to three feet off the floor. Once you are familiar with these two exercises, do them consecutively without rest in between. This method, called a superset, improves muscular endurance by allowing one muscle group to work while the opposing group rests. Do not train if you experience pain anywhere in your body. Check with your health-care provider before you start or resume training.